We had coffee at the bakery in Deloraine in the morning. 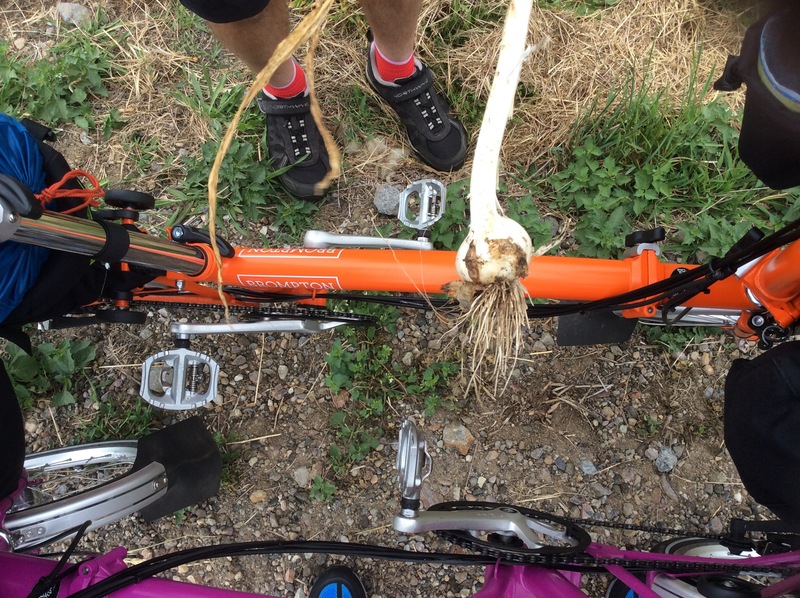 The Bromptons created a fair bit of interest parked outside the shop, and we fielded a few questions asking if the bikes were electric, if they were hard to pedal and just…why? Who needs an answer to that when it involves a bike (until it starts involving electronic shift then you might have to start asking…)? It was pleasant rolling along to Longford. The roads were quiet and we were able to relax as we trundled along. The rain came and went but it wasn’t cold (particularly on the uphills) so it wasn’t a problem. Mick spotted some garlic, which we planned to use for dinner that night (Artist as Family style), and we tried some apples. They were very unripe, and we didn’t think they would be any good…Artist as Family, do you have any ideas? It was only about 57km to Longford, but it seemed to take a long time. Being Tasmania, there were some hills, and, being tired after yesterday, we did not move quickly up those hills. The visitor information centre recommended we ride via Bracknell, then to Bishopsbourne and Toiboy to get to Longford. We enjoyed the ride and it was fantastic travelling along quiet country roads. Bracknell’s pub wasn’t open yet, but the small roadhouse had a good selection of takeaway food and grocery items. We can vouch for the hot chips! There’s rain up in those hills! While we were enjoying the bakery produce, Keith said hello. He lives in Longford and frequently cycles around the area. 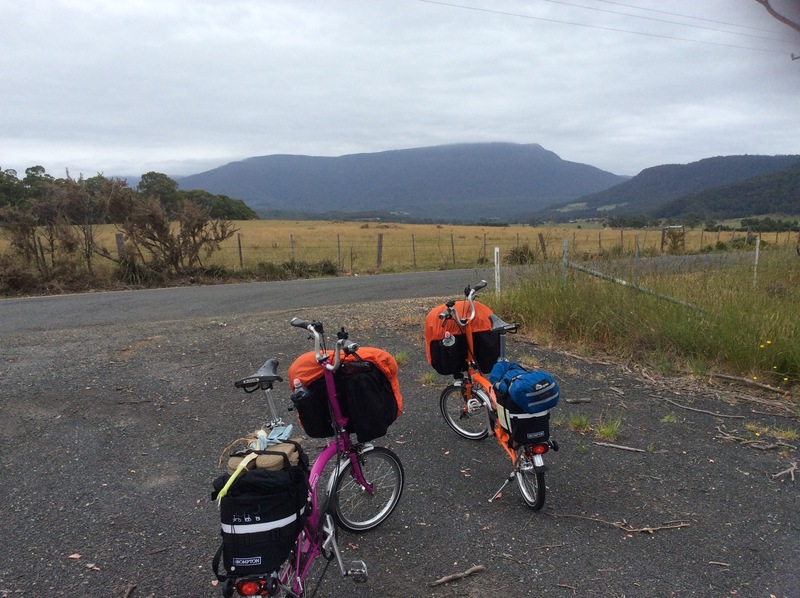 Keith told us the best way to ride was to head towards Cressy, then onto Campbell Town, a popular cycling stretch. Keith said not to turn off anywhere but to head straight to Campbell Town (remember this later). We decided this would be our plan. 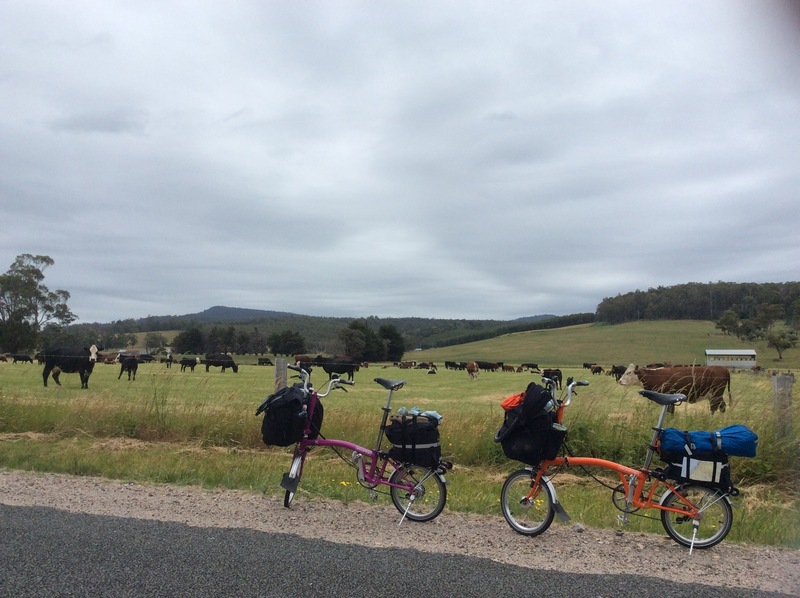 There were no seats available on the bus (which has to be pre-booked) and we decided we would just have to ride the 46km from Campbell Town to Oatlands on the highway. Tomorrow was going to be the day! It would be long, wet and quite possibly unpleasant on the highway, but it was game on! The rainy forecast lead us to opt for an ‘onsite caravan’ at Longford caravan park. We are not experienced caravaners so it was interesting paying all that money for one night in a VAN. It was nice and dry and quite well fitted out with a toilet and shower. There was an annex outside the caravan where we cooked dinner using our Trangia rather than cook inside and smell out the caravan. We got to use our freshly foraged garlic in a delicious slow-cooked stew (Trangia-style)! The caravan was okay, but we are still not sure how well the toilet would go longer term! Thankfully it rained all night and we felt very grateful and rather smug laying there in our caravan listening to the rain on the roof. At 6am the next morning we would be out of bed, preparing for an early start to Campbell Town then onto Oatlands. What? I have to wait ’til the next post to find out what happens? Because surely something besides “we rode straight along the highway to Campbell Town” happened… the old ‘scenic route’ struck again? Have to say, your original itinerary sounded very bold. Hobart via Tarralea?? It’s lovely, but a) hills, b) narrow, pot-holed roads and c) high chance of encountering logging trucks. Crikey! Logging trucks would have been preferable to the Falls Creek traffic (not so sure about the climbing)! And we like to string things out so you’ll have to wait for the next instalment. It’s a long one! Hey there to the intrepid travellers. I bet you are enjoying the rain coming from droughtsville Townsville. Countryside looks so green over there. Those Tasmanian hills sound a real treat for cyclists but my disappointment and amazement was extraordinary when learning Jenny walked the hill instead of riding. I am totally sure those hills could be no worse than those in Townsville. Looking forward to reading next instalment.